Tickets are on sale NOW, and can be purchased from inside LUMS (outside the khoka). 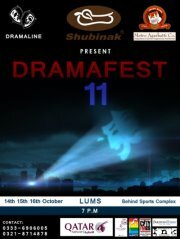 Dramafest is the all-Pakistan dramatics competition organized exclusively by DramaLine, the dramatics society at Lums . Not just participants but spectators from all over the country come to witness this spectacular amalgamation of talents. It is planned to bring out acting, directing and script writing talents from all over the country. Dramaline presents DramaFest'11 bigger and better than ever !! quality of dramatics they have to offer. Day-time activities : In order to keep the adrenaline running high, there will be games and activities such dramafest's got talent! and others, all keeping true to the idea of being dramatic! DramaFest will not only be a thrilling experience but also one in which the participants will learn and interact with the best. · Each institution can register for one team which may have a maximum of 20 members (including cast and crew). · Each team is to perform on one of the three days. Scheduling will be done by DramaLine. ·The teams can choose the skit genre of their choice. ·The performances should be of 25-35 minutes. ·The teams will be responsible for their props, costumes and make up. ·Complete set up including stage, lighting, on stage microphones and multimedia will be provided by DramaLine. ·No indecency or vulgarity in the skits will be tolerated. The skits will be screened by DramaLine before the actual performances. ·Each team member will have to pay Rs.300/- for registration. ·Teams outside Lahore will have to pay for their accommodation and transport within the city. Dramaline will make suggestions, but no arrangements for their stay.